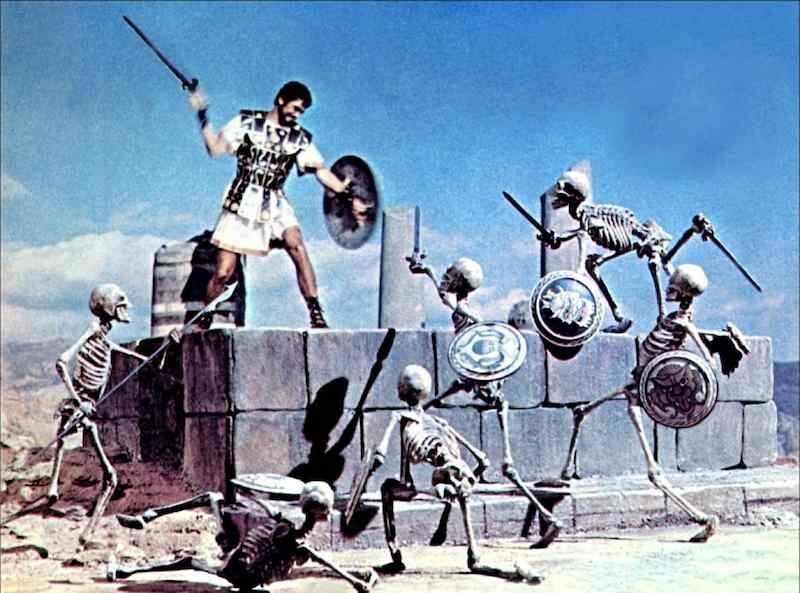 Squires cites the skeleton fight in Jason and the Argonauts as one of his all-time favorite effects sequences. Ben Sachs: I want to thank you again for commenting on my post about digital effects. You made me realize that my issue isn't with digital effects, but with filmmakers using them indiscriminately or to make up for lackluster storytelling. Scott Squires: There's so much potential to visual effects. Before [computer graphics], you could read about, say, a castle in the air or a guy turning into a cockroach, but it would be difficult to put that imagery on the screen and make it look realistic. Now filmmakers have the freedom to tell any story they want, but instead they're working with scripts that are half-baked. Not only that, but by the time a studio gives a movie the go-ahead [on production], they've already booked it in the theaters. The special effects people are on tighter deadlines than before. I'm talking about the "tent pole" effects movies. The reality is that there are visual effects in every Hollywood movie now. In some cases, it might be the addition or removal of certain details from a shot—you know, you shoot a movie in Georgia, but it's supposed to take place in New York, so you add in the Empire State Building or something like that. Even romantic comedies will use a green screen for some shots, to create the backgrounds. There are some websites that show "before-and-after" shots of locations used in Hollywood movies [like this one]. You'd be very surprised by some of them. How many movies does a typical visual effects artist work on in a year? It depends on the project and on your role. As a visual effects supervisor, I'm involved in a movie from the very beginning all the way to completion, which might be a year to two years. If you're compositing or working with models or doing another task like that, you might be on the movie for only a month. You could touch as many as ten movies in a year. I didn't get into this in my piece, but sometimes I find visual effects distracting if they look too real. I'm sure you're familiar with the concept of the uncanny valley. When someone knows that what he or she is seeing cannot possibly exist, even though it looks as intricate and "real" as the live-action subjects around it, in the back of his or her mind, they feel like something's off. That's my often my experience, anyway. That happens with effects that aren't computer generated. Take an elaborate car chase. You might watch one and think, "Wait a minute. How could they time all that exactly and get that car to flip while all this other stuff is happening?" It's a practical issue. Most effects artists strive to make things realistic, which often means "softening" the image to make it look like it was really photographed—especially if we have something [real] to compare to, like an actual person or part of a building. We try to match to what's real. The way [camera] lenses work, there's a little bit of coloration around light and the edges of some images. We'll actually duplicate all that within the computer graphics so that it looks as photorealistic as it can be. If I'm [designing] a building in New York that's very reflective—you know, it has windows all down the side—it's very easy to make it look "perfect" with computer graphics, meaning the windows come out as one flat surface. But if you look at a real building, you'll see that every window is slightly offset, and there's some distortion. The reflections aren't perfectly aligned; they're all a little bit out. Those little imperfections are what I and a lot of other artists strive for. 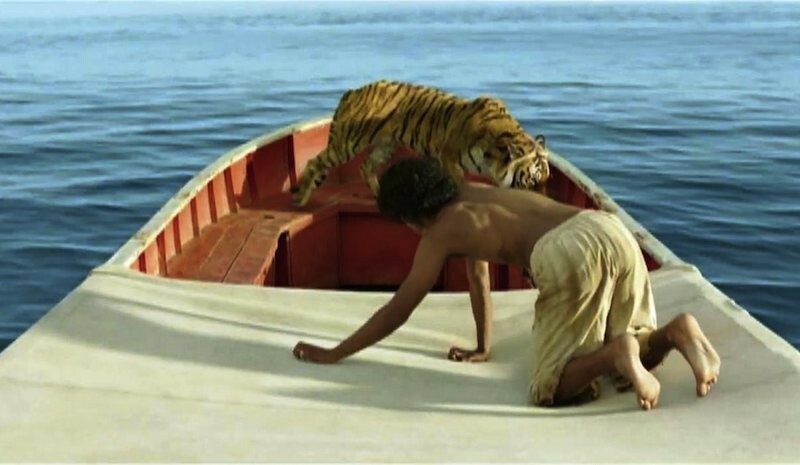 Like the effects team that [created] the tiger in Life of Pi—they photographed a lot of tigers to get their look and motions. It tends to be on lower-budgeted pictures where [digital images] look much cleaner than they should be, because they tend to be made on very rushed schedules. If you don't have the time and money to do all the precise work—all the little textures and reflections—it will stand out as fake. Is it common, then, for an effects artist to say, "We need more imperfections here"? That's definitely the case. But there's never enough time to do it exactly right. Digital effects will get you most of the way there in a reasonably short time, but it's that last ten percent of making it look right that takes a fair amount of time. Too often, though, the direction is that you've got to move on. You can only work at the quality level you have time to achieve. It's my job as the visual effects supervisor to try to keep that quality level up. I think special effects have a way of appealing to the imagination when the imperfections are visible. I'm not just talking about digitally created ones, but also the awkward movement of some stop-motion figures or the fingerprints you occasionally see on King Kong in the 1933 original. Personally, I feel closer to a special effect if I recognize a handmade quality. There's a particular aesthetic to stop-motion, and sometimes that's a desired look. Same with hand-drawn animation. When you see those, you're not thinking, "That's such a realistic thing." You're thinking, "That's an interesting thing." At one time, of course, stop-motion and the like did look realistic to viewers, because those were the most realistic effects out there. Of course, the skeleton fight of Jason and the Argonauts still looks great. A lot of that has to do with the design—and that extends to the choreography, the camera movement, and the stunts. That's missing from some [effects-driven] movies now, when you can tell they didn't spend the time planning it all out. Besides Jason and the Argonauts, are there any other films you especially love for their effects? 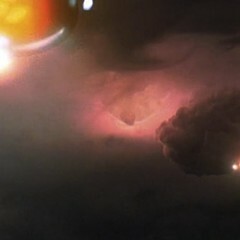 If I look at a movie in terms of effects, I'm always thinking how I could tweak this or that. The real question is, are you starting from something worth starting from? And then, do you have the time to execute that well? What do you consider the biggest misconceptions about special effects artists? A lot of people these days like to say that effects people are ruining movies, but it's important to understand that we work for the directors, just like production designers. We're not writing or directing these movies—it's not our fault if they're bad. Another thing to understand is that we visual effects artists generally strive for photorealistic imagery, but that can run counter to what the director wants. Take the case of fast-moving, large creatures. A large creature requires a few steps to ramp up to a certain speed—an elephant, you know, can't just start running at 60 miles per hour. But frequently directors tell us make it faster, make it faster, make it faster. So, these big, heavy things end up looking like they don't have any weight to them. It's very easy these days for directors to create a very stylized look. They'll create these synthetic camera moves that you could never get in real life and which run counter to photorealism. That can take an audience out of a film. You don't want to cut to digital effects shot just because you can. As a footnote to all of this, another problem we're seeing in the special effects industry now has to do with all the different [film production] subsidies [coming from outside of Hollywood]. Most visual effects work is happening out of the country—even on Captain America! Basically, you have other countries and other states within the U.S. paying the studios to take projects to other locations. If you look at a big movie now, you'll see that about a dozen different visual effects companies worked on it. That's a result of the subsidies and there being not enough time [for one company] to do it, so [the work] has to be spread out. The studios are now setting up new [special effects] facilities in other places, like Vancouver and Montreal, because there are high subsidies there. That means that [effects artists] in the U.S. are having to move to other locations for work. A few months ago, Sony Pictures told everybody in their visual effects division that they had to move to Vancouver if they wanted to keep working for them. The same thing happened with a [special effects] division in London—everybody had to move to Montreal. So, even though visual effects are responsible for all these tent pole movies—which is where the studios make a lot of their profits—the people making them are now migrant workers. There are efforts being made to neutralize the impact of these subsidies, but it's a difficult task.